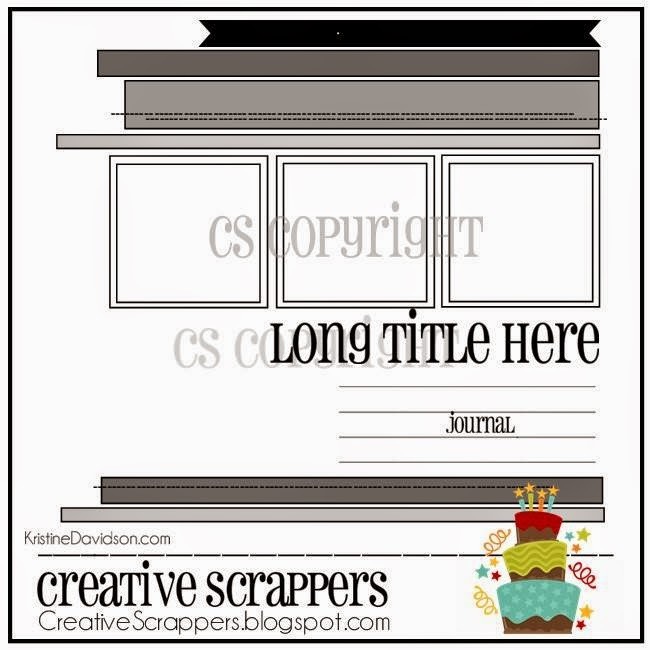 Welcome to the Creative Scrappers Blog Hop! We are celebrating 6 years of Creating with Sketches. We’re so excited to share 12 new sketches for you today and some inspiring layouts as well. We have tons of giveaways that will be happening throughout the day, so keep checking our feed and facebook page as well! 3. Help spread the birthday news. I got to play with this awesome sketch created by Kristine Davidson and it was a joy to work with! I used the Teresa Collins Daily Stories collection, which I think was a perfect fit for these photos. It was a huge challenge for me to do some handwritten journaling. I'm always scared to ruin my layout, but I thought I just had to do it. Danielle de Konink <you are here! Enjoy the Blog Hop, you're next stop is Jenny Evans! You know what.. I actually think your hand writing has " made" the layout.. It is such a sweet layout and your handwriting is perfect !! Super cute layout. You have very nice handwriting. Love your layout, the title is great and your journalling is great as well! Great sketch and I so love your page!! awesome page!! I love the little addition of the enamel dots!! I sure have to work with this sketch, your LO is STUNNING!!! Beautiful take on the sketch, Danielle! Such a fresh and pretty page! This is gorgeous! LOVING the colors and the stitching!!! Cute, cute Danielle! LOVE your take on the sketch! I loved you page! So cute! I think you have the hardest sketch (for me) but you did awesome with it! Love you layout! So sweet! Love the stitching! It's absolutely adorable! Thank you for the inspiration. Wow! 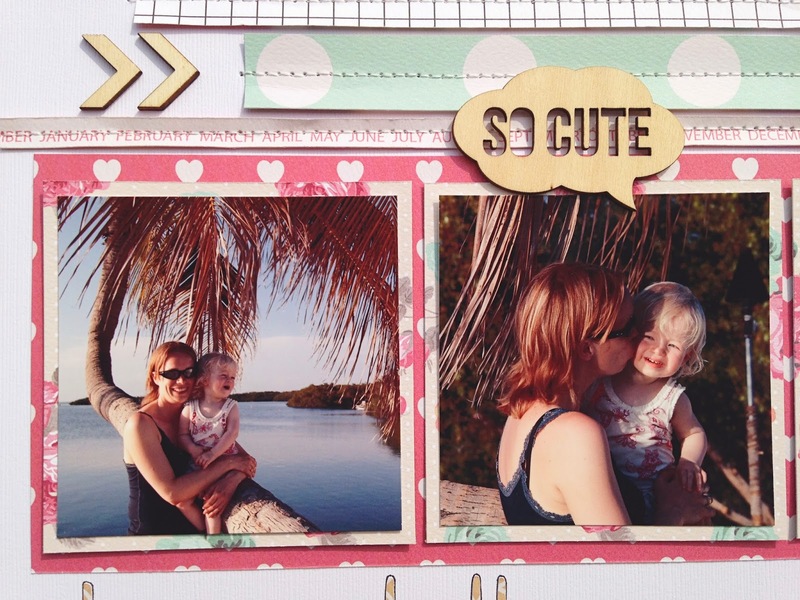 Love your LO using the sketch.....great colors, stitching, and adorable photos! Adorable! Love the sketch and especially your take on it!! LOVE this layout, love all those trips and the stitching, such sweet pics! Super cute layout. So happy to have found this new sketch blog. I agree, these papers are perfect for your adorable photos! Thanks for sharing your creative talent. Love what you did with the sketch. This blog hop is really fun and inspiring! Your layout is fantastic! Love the soft color and wood veneer. wonderful LO love the wood pieces and stitching!!!! I love the pictures. So cute, great momma/daughter photo shoot!!!! gotta love the Keys!! Fun layout! I love your sentiment...Love you to the moon and back! Sweet pics and layout! Love the color combo and stitching. So sweet & pretty! Love that long title! Great job with the sketch! It draws the attention straight to those sweet photos! Hi Danielle... I think the layout turned out great and the handwriting gives it such a personal touch. 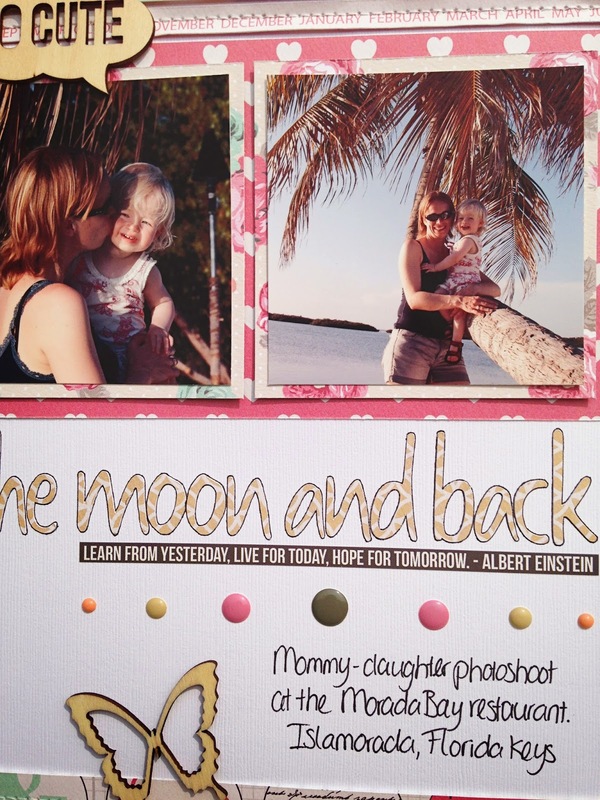 "I love you to the Moon and Back" is something we say to all the little ones in the family. It's such a cute phrase and so are the pics of you and your daughter. Oh yeah, I could devour a while cheesecake if the guilt finger would stop poking me on the shoulder :) Thanks for sharing your talent. Echt een onwijs gave LO, Danielle! Such a pretty layout! I love the soft colors! Holy cannoli---that is such an awesome layout! I absolutely love this LO. Your photos are awesome! Beautiful layout, love the colors and the stitching! Thanks for sharing! Oh your layout is the perfect compliment to the sweet pictures. Beautiful. 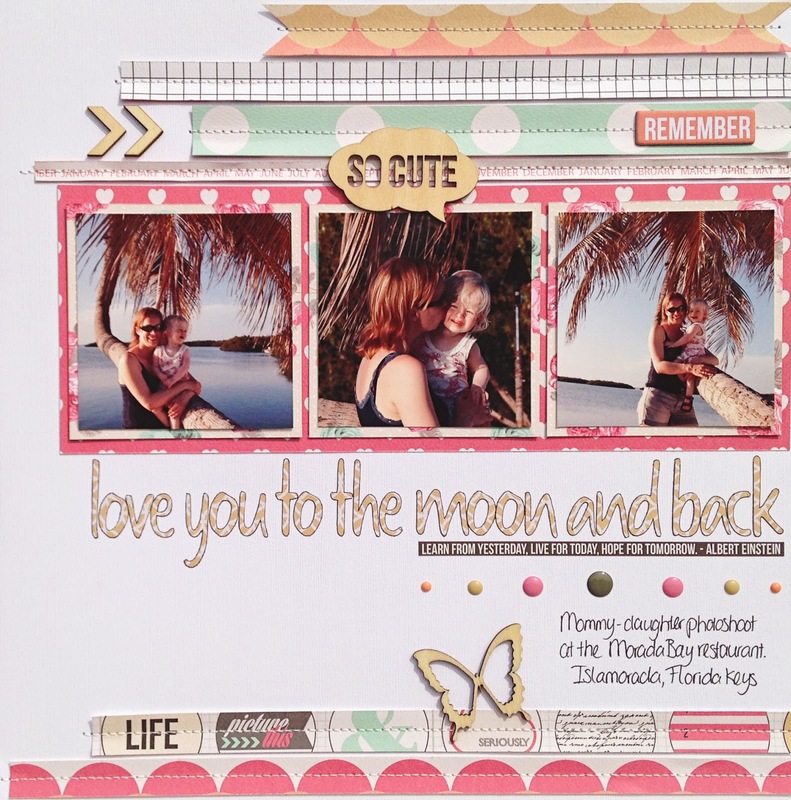 I love the soft colors you used on this layout Danielle and the wood veneers look awesome on your page!